But there were problems: In the 1970s, it became clear that most DNA did not code for proteins. Nobel Prize winner Francis Crick speculated that it was little better than junk and the term “junk DNA” was applied to the seemingly non-coding DNA. An early report from the Human Genome Project (issued in 2000) showed that over 95% of the DNA did not code for specific proteins. But was this “extra” DNA really junk or did modern science have a lot more to learn about the amazing intricacy of the cell? Postgenomics explores the confusing, yet exciting, world of science that has been thrust upon us as a result of the Human Genome Project. Once we knew the sequence of bases on human DNA, the expectation was that routine analysis would eventually yield all the secrets of disease, as well as determinants of such traits as height and obesity. Instead, the door has been opened to a confusing, often contradictory flood of information. In the opening chapter, we learn that many genetic traits are not determined by one or two sites on the genome, but by hundreds of sites at very different locations. Welcome to the world of what has come to be termed “postgenomics”—the time after the completion of the Human Genome Project where the genome is explored in conjunction with a myriad of phenomena involving control of gene expression and the regulation of processes both in the cell and in the organism. The genetic reductionism that was supposed to come as a result of the project has given way to a complicated world where environment and other factors must be considered. Early chapter explore the complexity of processes in the cell. The former assumptions about non-coding (“junk”) DNA are laid to rest in the discussion of the formation of regulatory molecules that greatly influence the behavior of the organism. Signal modulation by non-coding RNA appears to play a significant role in cellular processes. The growing idea of epigenetics is explored—how DNA is regulated in ways other than modification of bases pairs in the structure. These changes may be permanent or transient. One very interesting chapter focuses on the influence of the maternal environment on the developing child before and after birth. The controversial field of behavioral genetics is covered in a chapter titled “Behavior Genetics to Postgenomics.” The writer describes many unsuccessful attempts to find genetic aspects of such disorders as manic-depressive illness and alcoholism. He also points out that, contrary to current propaganda, there is no “gay gene”—the early studies could not be replicated by outside investigators. The analysis of current research on genetics of the serotonin transporter gene and its relation to depression point out the pitfalls in research on mental disease. Postgenomics also moves out of the “hard” sciences into an arena that is at least as complex as the scientific processes being explored. The Human Genome Project has led to the generation of massive amounts of data; this information is stored and shared on databases, some of which are available to other scientists and some of which are available to the general public. The accumulation of all this information has raised a question that is very pertinent to scientific professionals—what is considered to be publication? The answer has a great influence on reputation, tenurability at research universities, and the ability to obtain further research grants, among others. At present, there are no clear answers to the questions, but resolution is needed since the outcomes will affect the careers of many individual scientists. Documentation is thorough, with notes at the end of each chapter. A lengthy bibliography of approximately 35 pages is at the end of the book. In addition, information about each chapter author is provided, along with URL links to their web pages. 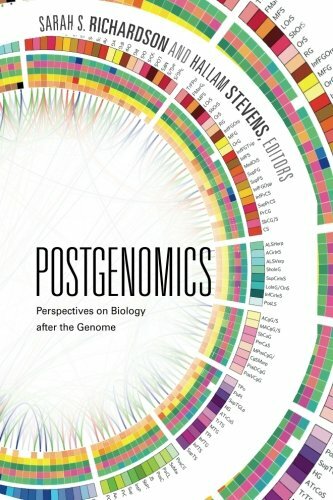 Postgenomics is a challenging book that covers a wide span of scientific, social, and public policy issues. It is an excellent resource for anyone who is interested in this complex and ever-changing field of study.